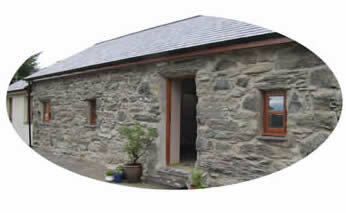 Glas y Dorlan holiday cottage near Criccieth enjoys a rural location with views across to the mountains of Snowdonia. It’s a perfect place to enjoy a relaxing holiday or short break in the countryside. Situated two and a half miles from the pretty coastal town of Criccieth with its two beaches, and close to the busy harbour town of Porthmadog this comfortable and relaxing farm cottage is in an ideal spot for anyone looking for holiday accommodation when visiting Snowdonia or the Lleyn Peninsula. Glas y Dorlan is welsh for kingfisher, which are resident here on our Fishery. You can enjoy a fishing holiday with our five lake coarse and trout fishing complex, or relax and enjoy the peace and quiet of this rural haven which is 500 yds from the Fishery along a private driveway. The well equipped holiday cottage has underfloor heating and a log burner making it ideal for a self-catering holiday or short break any time of the year. Sleeping four in two bedrooms/bathrooms it’s also ideal for couples who enjoy discounted rates when only using one bedroom/bathroom. We are a working farm but dogs are welcome, with an enclosed garden and small paddock for off-lead exercising, there are many walks leading right from the front door of the cottage. As well as fishing, there is much to enjoy right , this is a superb place for walkers, cyclists and golfers with secure storage and drying facilities for all your gear.